VATICAN CITY (CNS) — Recognizing that Blessed John XXIII and John Paul II have widespread reputations for holiness and that years of studying their lives and actions have proven their exceptional virtue, Pope Francis announced he would declare his two predecessors saints at a single ceremony April 27. 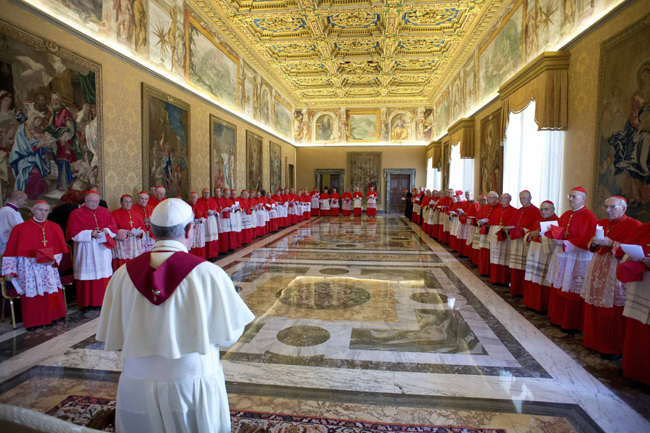 The pope made the announcement Sept. 30 at the end of an “ordinary public consistory,” a gathering of cardinals and promoters of the sainthood causes of the two late popes. The consistory took place in the context of a prayer service in Latin and included the reading of brief biographies of the two sainthood candidates. Cardinal Angelo Amato, prefect of the Congregation for Saints’ Causes, read the biographies and highlighted the “service to peace” and the impact both popes had “inside and outside the Christian community” at times of great cultural, political and religious transformation. The testimonies of their lives, “completely dedicated to proclaiming the Gospel, shine in the church and reverberate in the history of the world as examples of hope and light,” the cardinal said. Blessed John Paul, known as a globetrotter who made 104 trips outside Italy, served as pope from 1978 to 2005 and was beatified by Pope Benedict XVI on Divine Mercy Sunday, May 1, 2011. 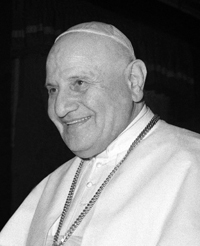 Blessed John XXIII, known particularly for convoking the Second Vatican Council, was pope from 1958 to 1963; Blessed John Paul beatified him in 2000. Asked by reporters if retired Pope Benedict would participate in the canonization ceremony, Jesuit Father Federico Lombardi, Vatican spokesman, told reporters it was possible, but given the retired pope’s preference for staying out of the public eye, he could not say for sure. The choice of April 27, which will be Divine Mercy Sunday in 2014, was not a complete surprise. Speaking to reporters traveling with him from Brazil to Rome July 28, Pope Francis said he had been considering Dec. 8, but the possibility of icy roads could make it difficult for Polish pilgrims who would travel by bus to Rome for the ceremony. 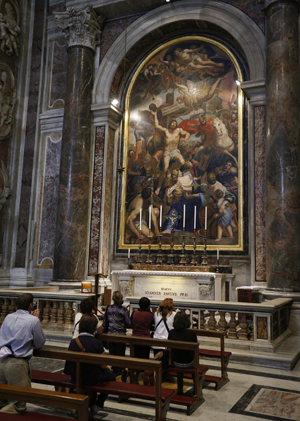 The other option, he said, was Divine Mercy Sunday, a celebration instituted worldwide by Pope John Paul. Since the beginning of his pontificate in March, Pope Francis has emphasized God’s mercy and readiness to forgive those who recognize their need for pardon. 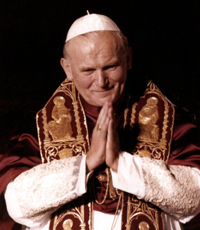 He told reporters on the flight from Brazil that Pope John Paul’s promotion of Divine Mercy Sunday showed his intuition that a new “age of mercy” was needed in the church and the world. Pope Francis signed a decree recognizing the miracle needed for Blessed John Paul’s canonization July 5; the same day, the Vatican announced that the pope had agreed with members of the Congregation for Saints’ Causes that the canonization of Blessed John should go forward even without a second miracle attributed to his intercession. Except in the case of martyrdom, Vatican rules require one miracle for a candidate’s beatification and a second for his or her canonization as confirmations that the candidate really is in heaven with God. However, the pope may set aside the rule.